Mathias Kremer (left), Bayer’s Head of Crop Science for the Andean Countries, Central America and the Caribbean, and Manuel Otero, Director General of IICA. Berlin, 07 February 2019 (IICA). Sustainability, food safety, the empowerment of women in rural areas and the correct use of products are the primary areas of focus of a new partnership between Bayer and the Inter-American Institute for Cooperation on Agriculture (IICA). 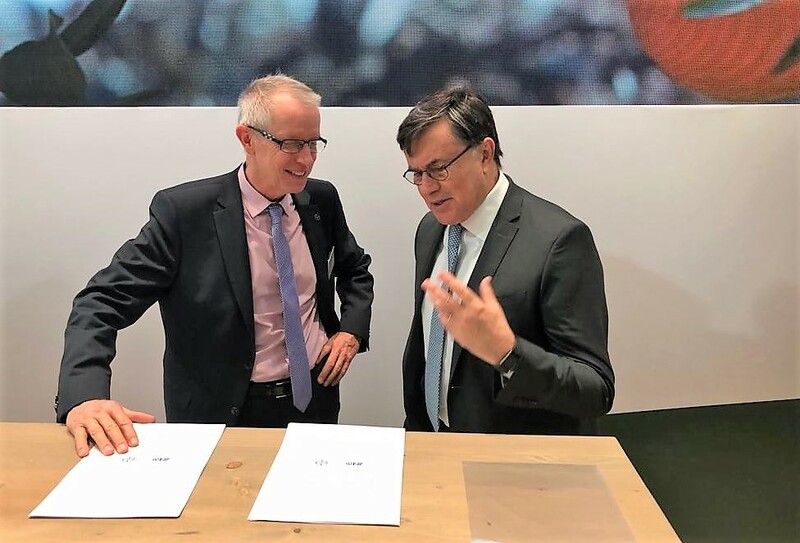 The partnership was established through a general cooperation agreement, which was signed today in Berlin at Fruit Logistica 2019, an event attended by more than 78,000 fruit and vegetable importers, exporters, producers, wholesalers, retailers, and packaging and logistics specialists from 130 countries. The key objective of the cooperation between the two institutions is to promote agricultural development and rural well-being, and to support agroindustry in Latin America and the Caribbean, a region which is considered to be the leading global food provider. The agreement addresses issues such as access to and exchange of knowledge, science, technology, innovation and financial resources for the purpose of strengthening sustainability and food security. Mathias Kremer, Bayer’s Head of Crop Science for the Andean Countries, Central America and the Caribbean, who signed the agreement with the Director General of IICA, Manuel Otero, remarked that, “Agriculture is a fundamental part of Latin American economies and the professionalization of the sector enables us to produce more food in smaller spaces”. Challenges in the rural areas of Latin America and the Caribbean are linked to issues on the global agenda to achieve the UN Sustainable Goals, which include the reduction of losses in the chain, small producers’ access to new technologies and food traceability. Manuel Otero, Director General of IICA, maintained that, “The region of the Americas has the potential to guarantee world food security and it should, by substantially increasing exports and also safeguarding access to and the supply of food for our 600 million inhabitants. In order to do so, we must recognize the strategic nature of public-private partnerships”. The agreement is closely aligned with IICA’s 2018-2022 Medium Term Plan - the institutional roadmap of the specialized agency in agricultural development -, which has five areas of focus, including safety. The Bayer-IICA partnership will also place special emphasis on food safety-related issues in joint projects. Good Agricultural Practices, the monitoring of chemical residue in food, and biodiversity, are key issues that will be addressed in pilot programs in the region. Otero explained that, “Each region has different needs and different opportunities. The key is to see rural areas as spaces of opportunity, innovation and progress, in order to create and foster rural retention by providing quality employment”. One of the Bayer programs that could be used in training and other projects is Bayer FowardFarming (BFF): an initiative that led to the establishment of sustainable farms in Argentina, Brazil and Chile. Production on these farms is based on international standards for agriculture and they now serve as benchmarks in the regions where they are located. According to Mathias, “Disease control in crops is closely linked to the protection of natural resources and human welfare. It is evident that sustainable agricultural production on these farms is something that benefits everyone”. Bayer is a multinational Life Science company with core competencies in the areas of health care and agriculture. Its products and services are designed to benefit people and improve their quality of life. At the same time, the Group aims to create value through innovation, growth and high earning power. Bayer is committed to the principles of sustainable development and to its social and ethical responsibilities as a corporate citizen. In the 2016 fiscal year, this Group, which employs about 99,600 people, had sales of 34.9 billion Euros and capital expenditures amounting to 2.2 billion Euros, devoting 4.4 billion to research and development. For more information, go to: www.bayer.com.